You may have seen hair oils in the supermarket or hairdresser, and wondered what they do, and whether you need to use one for your hair. Hair oils are a wonderful product, and should be a part of most peoples care program. Hair oils nourish, condition, and moisturise your hair, they soften and detangle hair, and depending on the type of oil, they can add nutrients and antioxidants to your hair and scalp. 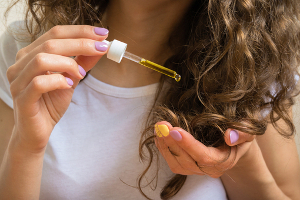 If you are after shinier, healthier looking hair, it is well worth adding a hair oil to your haircare routine, and there are oils for all hair types, even fine – you just need to find a hair oil to suit your hair’s needs. So what are our picks of the best hair oils? Read on to find out. When Moroccanoil Treatment burst onto the hair care scene 10 years ago, it virtually created the Hair Oil category. Infused with antioxidant-rich Argan Oil, and shine-boosting vitamins, this transformative hair treatment can be used to help detangle, speed up drying time, and boost shine, leaving you with nourished, manageable and smooth hair use after use. The multi-purpose Moroccanoil Treatment can be used as a conditioning, styling and/or finishing tool. Suitable for all hair types, as it is so good at treating dry, frizzy or dehydrated hair, it’s brilliant for mature hair. If you have fine or lighter coloured hair (including platinum and white), the oil comes in a Light formula, especially suitable for these hair types/colours. 100ml RRP $63.95. Also available in 25ml travel size. If you’re finding your hair is becoming thin and fragile with age (or if your hair has always been thin and prone to damage), then the Matrix Biolage ExquisiteOil Strengthening Treatment Oil could be just what you are looking for. ExquisiteOil Strengthening Treatment is formulated with Polynesian Tamanu Oil for an ultra lightweight, scented oil that helps to strengthen thin, fragile hair. The multi-use treatment can be used before conditioning, as a finisher or overnight as a treatment. When used over time, resistance to breakage is boosted, your hair is replenished with moisture and condition, and you are left with an irresistible shine. 92ml RRP $33.00. The lightweight formula of the John Frieda Frizz Ease Nourishing Oil Elixir is enriched with Argan Oil to help soften dry and unruly hair, and an insider tip, it’s really good at softening and moisturising curls. The Argan Oil infuses your hair strands, keeping them super soft, supple, and shiny (so it’s great for mature hair), whilst helping to reduce hair frizz. The oil is fast-drying and leaves your hair manageable without any greasy residue. The delicately scented oil is suitable for all levels of hair frizz, and is formulated for safe use on coloured and chemically treated hair. 88ml RRP $16.99. L’Oréal Paris Elvive Extraordinary Oil Treatment is enriched with 6 precious flower oils, and the formula deeply penetrates your hair fibre for ultimate nourishment and protection without leaving hair greasy. The oil can be used before shampooing as a mask, before blow drying to protect your hair, or when styling to keep hair wonderfully hydrated. When used in your haircare regime, the oil works brilliantly at protecting your hair from styling damage. The oil comes in 3 formulations, so you can find one to suit your hairs needs – normal for normal to dry hair (pictured), ultra-light for fine hair, and extra rich for dry and damaged hair. 100ml RRP $19.95. Specifically designed for dry hair, Garnier Fructis Nutri-Repair 3 Miraculous Oil is enriched with weightless Argan and fruit oils in a non-greasy formula that absorbs quickly and easily into your hair for instant nourishment. The oil can be used before shampooing, added to conditioner, or applied to dry hair throughout the day for a boost of moisture. Whichever you choose, whatever your hair needs, your hair is left hydrated, shiny, smooth, protected and irresistibly soft to touch. 150ml RRP $11.99. Have we tempted you to try a hair oil? Are you already using a hair oil? If so, which one? Let us know in the comments below.